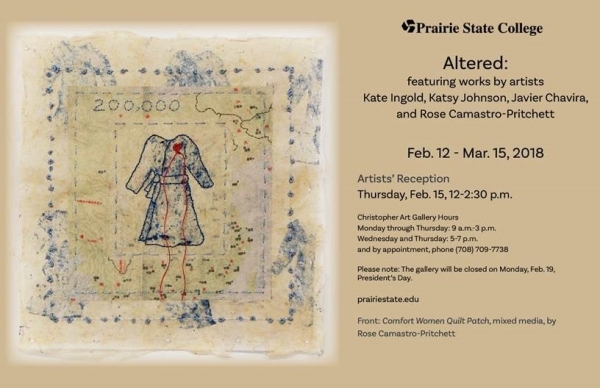 Prairie State College’s Christopher Art Gallery new exhibit “Altered” features works by artists Rose Camastro-Pritchett, Javier Chavira, Kate Ingold and Katsy Johnson. The exhibit will open on Monday, February 12 and run through Thursday, March 15. An artists’ reception is scheduled from noon to 2:30 p.m. on Thursday, February 15. Both the exhibit and reception are free and open to the public. Art featured in the exhibit incorporates images that have been altered using existing prints from online, art history, newspapers or other sources. The artists make use of images and change and transform them by adding other media, manipulating them or changing their entire context to make them their own and add impact. 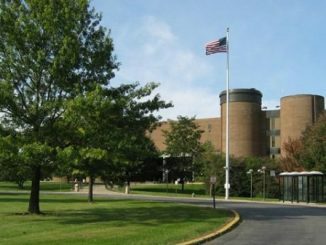 The Christopher Art Gallery is located at PSC’s main campus 202 S. Halsted St. in Chicago Heights. The Gallery is open Monday through Thursday from 9 a.m. to 3 p.m., and Wednesday and Thursday from 5 to 7 p.m. The college will be closed Monday February 19 for President’s Day. The Gallery may also be visited by appointment. 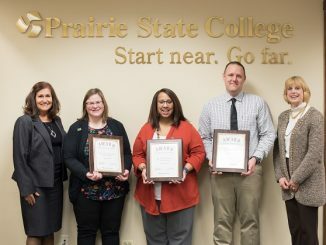 For more information or to schedule an appointment to view the exhibit, visit www.prairiestate.edu/artgallery or call 708- 709-7738.